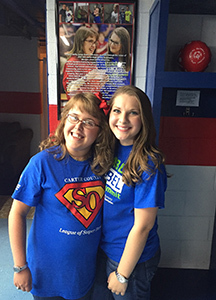 This time last year brought Easter Carter High School Unified pair Brianna Gee and Morgan Jones together to apply for the 2nd GenUin: Special Olympics Social Impact Summit. Their application presented the opportunity to transform the school’s away locker room that was in need of renovation into a Unified locker room that was accessible to ALL the school’s students. The locker room would provide accessible showers, lockers, and a message that would be seen and heard by every visiting school. The message that East Carter lives by daily; that they “LIVE UNIFIED AND PLAY UNIFIED”! October came and they were informed that their application was not selected but they were super excited that fellow Kentucky Youth Activation Committee members Lindsey Wagner and Tori Cobb, of Murray, had received a grant. Wagner and Cobb’s proposed project recognized the obstacles people with disabilities face in trying to lead healthy lifestyles and seek to provide a healthy lifestyles workshops that promotes healthy eating, emotional and physical health and fitness classes for people with disabilities. What Gee and Jones didn’t know was that during one of SOKY’s two Fall Youth Leadership Summits there was to be a special presentation. Special Olympics Kentucky would announce that the organization was going to support their project. During the Regional Girls Basketball Tournament game between East Carter and West Carter High Schools a message of inclusion and a check was presented to Morgan, Brianna, and their school’s community. Their renovation plans went into motion. Over 1,000 volunteer hours including financial and material donations by students, school administrators, parents, and the community went into the locker room transformation. This locker room will now provide inclusive opportunities for East Carter students to train and compete within the school and sports offered by the Kentucky High School Athletic Association for years to come. This locker room won’t just impact students within the walls of East Carter High. It is utilized by every visiting school which East Carter competes with throughout the school year. The walls of the locker room share a message of inclusion and acceptance including the opportunity to sign the R-word Pledge. The goal is to have visiting student athletes and coaches ask questions with the hopes that their school will share in the legacy that Brianna and Morgan have left at East Carter. Brianna and Morgan graduated from East Carter this past school year and worked tirelessly to complete the project prior to the new school year starting. The locker room was open to the public by way of a whole school assembly ribbon cutting ceremony on Friday, August 18, 2017. The legacy they leave for their peers is they too can impact a community with individuals from all walks of life to live unified, play unified and share forward a message that will reach far beyond the walls of East Carter High School. For more information about the Special Olympics Kentucky Unified Champion Schools Program or to get your school involved, contact Karen Michalak-Parsley at 502-326-5002 or kparsley@soky.org or Justin Harville at 502-695-8222 or jharville@soky.org.